Herz press fittings can be connected quickly and safely in conjunction with Herz multilayer pipes. 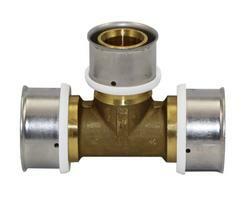 The company offers radial press fittings made in dezincification-resistant (DZR) brass with in-house fabricated stainless steel bushes. The press fittings are available in a range of forms and sizes for the connection of plastic composite pipes in heating and cooling systems. Connection fittings are tested for conformity to standards and accredited by externally recognised testing centres in many European countries. A 10-year guarantee for pipe fixing systems is offered.